This series of lessons will teach you how to take your Arduino projects to the next level by having the Arduino interact with the Python programming language. Python is a free program you can download. Since you have already learned the fundamentals of programming through our first 20 Arduino lessons, learning Python will be a snap! Python with Arduino LESSON 1: This lesson introduces the concepts and shows a cool project I did combining Arduino and Python. Python with Arduino LESSON 2: This lesson shows you how to install the free software packages and libraries to allow Arduino and Python to work seamlessly together. Python with Arduino LESSON 3: This lesson shows you how to create your own virtual world in Python with the Vpython library. You can then dynamically update your virtual world to match what is happening in the real world. Demonstration is based on measuring distances with the Arduino an an HC-SR04 ultrasonic sensor. Python with Arduino LESSON 4: This lesson shows you how to expand your virtual world by including both a distance and color sensor. This creates a scene where the distance to the target and the color of the target dynamically update to track what is happening in the real world. Python with Arduino LESSON 5: This lesson shows you how to build your virtual world in Python using the vPython library and dynamically updating it based on data streaming from the Arduino. Python with Arduino LESSON 6: This lesson shows you step-by-step how to install PIP. Many of the future lessons will require you to have PIP on your computer, so you need to pause now and get it installed. I suggest watching the video in the lesson and following along to get your PIP installed correctly. Python with Arduino LESSON 7: We want to start adding powerful graphing capability to our projects, so we need to download and install the matplotlib library. This lesson will take you through it step-by-step. Python with Arduino LESSON 8: This tutorial presents a simple step-by-step Introduction to Matplotlib for creating graphs and charts in Python. Python with Arduino LESSON 9: This tutorial shows how to read temperature and pressure with the adafruit BMP180 sensor. This lesson gets the sensor hooked up and the arduino programmed to read data from it, and then in the next lesson we will begin streaming and graphing live data. Python with Arduino LESSON 10: In order to plot live data in Python using matplotlib, we need another library called drawnow. This tutorial shows how to install drawnow. Python with Arduino LESSON 11: This lesson shows how to plot and graph live data from the Arduino using Python and Matplotlib. This allows us to display live data in a useful and informative way. Python with Arduino LESSON 12: This lessons looks at the math needed to calculate changes in height from changes in pressure. We make the simplifying assumption of constant Temperature. Python with Arduino LESSON 14: This lesson provides an introduction to using Xbee radios for wireless communication. This allows you to communicate between Arduino and Python via wireless. This introductory lesson covers that hardware that is needed. Python with Arduino LESSON 15: This lesson shows you how to program the Xbee radios, and use them with Arduino to wirelessly stream data to Python on the PC. Python with Arduino LESSON 16: Simple Client Server Configuration over Ethernet. This lesson will help you get your arduino set up as a server, and talking to a client in Python. Python with Arduino LESSON 17: In this lesson we use the arduino as a server and Python as a client. Python sends a request to measure temperature or pressure. 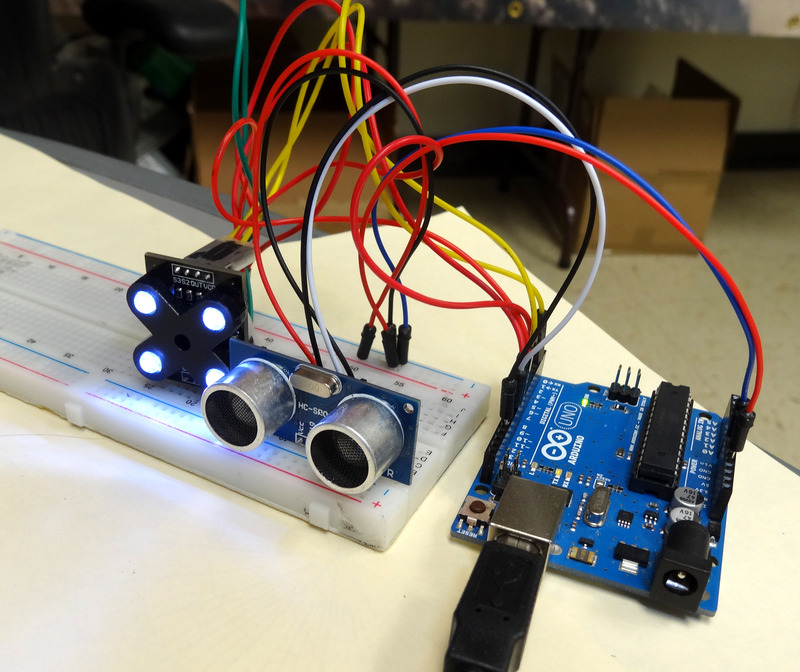 Arduino reads the request, makes the requested measurement, and then sends the data back.